We highly recommend you read through the below PDF’S. Take the time to learn about this amazing substance. Fulvic Acid has proven itself to be an essential and natural remedy for life forms. Fulvic Acid comes into existence in extremely small amounts when millions of microbes, with an adequate supply of oxygen, work in a soil environment on plant matter. It is a part of the humic structure in composting, rich soil. It is composed of a high amount of enzymes, antioxidants, natural bio-chemicals, hormones, free-radical scavengers, nutrients, amino acids, super oxide dismutases (SOD), natural fungicides, natural antibiotics, and natural antivirals. It has a low molecular weight and is hyper-active biologically. Due to its low weight, it is capable of readily bonding elements and minerals into its molecular structure, in turn dissolving them to become Fulvic complexes. Fulvic Acid from humate (or humic) deposits often comprises of 60+ trace elements and minerals dissolved into its molecular complexes. This is a natural and ideal form for them to interact with, and dissolve into living cells. Plant cells and roots usually have high amounts of Fulvic acid stored in their structure. Studies suggest that these Fulvic acid complexes are vital for the sustenance of plants. Unfortunately, Fulvic Acid is still not properly recognized and understood by a majority of the medical and scientific community. Due to the extremely complex nature of Fulvic acids, chemists have been unable to synthesize, or even clearly define them. This leaves little room for science and medicine to benefit from the wonders of Fulvic acids. There has been an increasing number of reports from consumers about the positive effects on health, and many of these claims suggest that Fulvic acids have the potential to prevent against diseases and maximize longevity. It leads us to the fact that in the long run, Fulvic acid has the potential to pose a serious threat to the future of doctors, health professionals, and pharmaceutical companies; however, it’s positive news for alternative health industry and the public. Fulvic acid has not been given due importance until now, despite the fact that it has been extensively used in India and China for several years now. In our opinion, making Fulvic acid an active part of your health supplements can have surprisingly beneficial results. Fulvic readily complexes with metals and minerals in soil, enabling easy access and absorption for the plant roots through cell walls. It makes mobility-resistant minerals, such as iron, easily transportable through plant structures. It also transports and dissolves auxins, hormones, vitamins, natural antibiotics, and coenzymes that are normally found in soil. These substances are very effective in enhancing the overall vigor and growth. These substances come into existence through decomposition of vegetation in the soil by certain fungi, antinomycetes, and bacteria. Studies suggest that all known vitamins are likely to be present in healthy soil. Although plants produce vitamins on their own, many of these substances from the soil further aid the plant. Since these nutrients are in their natural form, they can easily by absorbed by humans and animals upon ingestion. Fulvic acid is capable of transporting dissolved minerals and elements that are many times its own weight. A remarkable characteristic of humic/Fulvic substances is their sorbing nature, and the ability to interact with environmental chemicals, either before or after encountering toxic concentrations. “Paraquat”, a toxic herbicide, is instantly detoxified by Fulvic. With regards to the dissolution of organic compounds applied to soil as pesticides, Fulvic acids have a unique function. It has been proven that Fulvic acids play a major role in forming new metal ion species, binding with natural pollutants such as herbicides and pesticides, and breaking down toxic pollutants. Radioactive substances have been known to react instantly with Fulvic, reaching the equilibrium in a very short span of time. All radioactive substances can react with Fulvic acid and form organo-metal complexes of different adsorptive stability and solubility. Fulvic acid increases the availability and absorption capability of nutrients. It also improves the regeneration of minerals and prolongs the timespan for habitation of essential nutrients. It also aids the nutrients in reacting with cells. Fulvic acids allow nutrients to react with each other, which leads to their breakdown into the most basic ionic forms. Fulvic acid is capable of energizing cell life. As soon as it encounters a cell, the restoration and healing process of the cell starts. Fulvic acid provides a supply of crucial electrolytes, improves and mobilizes nutrients, prompts enzyme reactions, enhances assimilation, vitalizes metabolism, and alters inorganic minerals into naturally complex minerals. It also changes the detriments of poisonous compounds e.g. free radicals and heavy metals, and it also enhances the penetrability for circulatory, digestive, and cell membranes. Fulvic Acid has been observed to greatly enhance the plants’ genetic mechanism. Studies have established that any type of exposure of plant cells to Fulvic acid results in an improved growth. Fulvic acid causes an intense absorption of oxygen, and also helps in transporting it to the roots and then instantly back to the shoots of plants. It also eradicates deficiency of oxygen and enhances the essential activity of cells. Fulvic acids have been known to change the metabolism pattern of carbohydrates, leading to a gathering of soluble sugars. Plants become capable of withstanding wilting due to the increased osmosis pressure inside the cell walls, caused by the soluble sugars. Furthermore, Fulvic acid improves growth and energizes the immune system. Due to the low molecular weight and low molecular size of metal organic Fulvic acid complexes, they have a high capability of penetrating into cells. They are even capable of passing though semi-penetrable membranes, such as cell walls. It is worth mentioning though that Fulvic Acids can not only transport nutrients, but also result in sensitization of cell membranes, as well as several physiological functions. 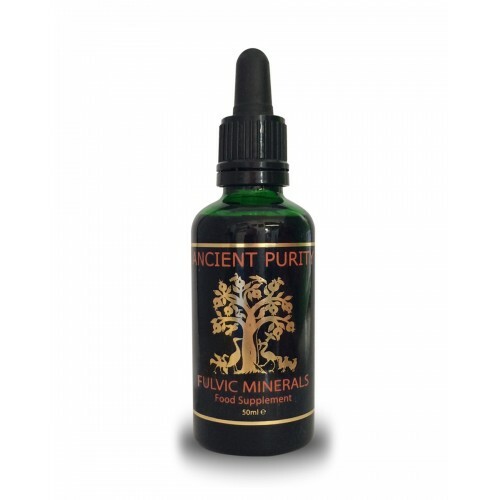 Estimated shelf life from purchase: 4 years (Fulvic Minerals can be over 1 million years old already).